Demystify online dating Internet dating can be frustrating or fruitful. It will be less exasperating if you know how to read and weed out unsuitable men's profiles. And you'll have a steady flow of potential suitors if you can write a compelling profile. Online dating sites can be daunting for newbie midlife daters. How do you navigate the catalog of potential sweeties and connect with those likely to be a fit? How do you learn the secret code in some profile descriptions? Many midlifers reentering the dating pool think joining an online dating site will be the perfect way to have an unending stream of potential sweeties filling their inbox with flirty, witty and alluring emails. Sure, it can happen. And it does for a few. But many of those listed on dating sites never get one date. Not one. How can you mine the dating pool to yield nice, interesting, sane, and caring potential sweethearts? 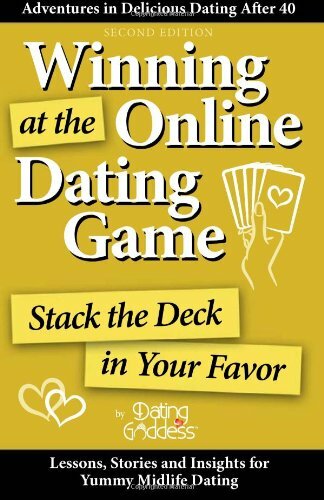 This book focuses on the ins and outs of Internet dating. Just like a sport, hobby or game, online dating has it's own rules and language - although there's rarely a guidebook or glossary. If you don't understand how online dating works, you'll waste a lot of time connecting with incompatible men. Learn to understand common online terms, how to respond to winks/flirts/kisses and IMs, and when to give your phone number - if ever. Dating sites are a great way to shop for men as there is so much "inventory" online. But make sure you're not scouring the sale bins and getting what everyone else rejected. If you're an over-40 single woman and want to try online dating, Winning at the Online Dating Game can help your search for your next mate.